regular detectives — official ones like Flat Foot Flannigan, private ones like Slam Bradley and funny ones like Silly Sleuths, but basically just common, ordinary detectives. As superheroes took over comics, the detectives became superhero-like — The Crimson Avenger, Air Wave, and of course, Batman. Later genres such as TV tie-ins (Roy Raymond, TV Detective) and science fiction (J'onn J'onzz, Manhunter from Mars) were represented among Detective Comics' detectives as well. Pow Wow Smith, Indian Lawman, was the title's only western detective. "Pow Wow Smith" was a monicker laid on the character by the townspeople of Elkhorn, where he did his lawman work, first as deputy and later as full-fledged sheriff. His real name was Ohiyesa, which means "Winner" in the Sioux dialect he grew up with back in Red Deer Valley. When he started exploring white society, he tried to use his real name. Eventually, he gave in to the inevitable and became Pow Wow Smith in everyday life, reverting back only when visiting home. His main supporting character was his deputy, Hank Brown. He also picked up a fiancee, Fleetfoot, along the way. Racial issues usually didn't concern him — he was liked and accepted by the Elkhorn populace, with only mild grumbling from an occasional curmudgeon (who was usually converted by the end of the story). 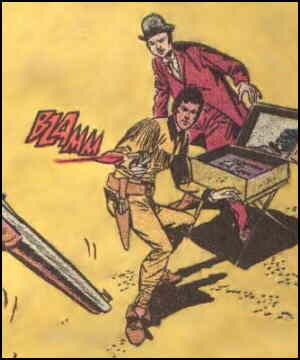 His series, which began in Detective Comics #151 (September, 1949), was set in the Old West. This means the exact location was unspecified but it had a lot of desert and mountain terrain in the vicinity, and it took place approximately in the 1880s. The writer who kicked it off was Don Cameron (Vigilante, Superboy and a host of other 1940s DC characters) and the artist was Carmine Infantino (Phantom Stranger, Adam Strange and more throughout the 1950s and '60s). Neither stayed with Pow Wow for long. Later writers of the Detective Comics series are unidentified, but the artist on most of it was Leonard Starr (later famous for Mary Perkins). Pow Wow ran more than four years in Detective, but the series ended in #202 (December, 1953, the same one that saw the last of Robotman). But he was being promoted, not dropped. Starting with the January, 1954 issue (#43), Pow Wow was the cover feature of Western Comics, eclipsing The Wyoming Kid. Infantino was back as his regular artist, with scripts first by France Herron (Captain Marvel Jr.) and later by Gardner Fox (Hawkman). He remained on the cover half a decade. In 1959, he lost that position to Matt Savage, Trail Boss, but stayed in the back pages as long as Western Comics lasted. It ended with its 85th issue, dated February, 1961. Since then, Pow Wow has been seen mostly in reprints. He did turn up in a new story in Detective Comics #500, which he shared with Jason Bard, The Human Target, Captain Compass and other former denizens of the title's back pages, never mind the fact that the rest were set in the present day. Text ©2005-09 Donald D. Markstein. Art © DC Comics.